Mars Petcare’s Temptations brand is launching a marketing campaign to back its new interactive toy. The Snacky Mouse is a weighted, mouse-shaped wobble toy designed to dispense Temptations treats as cats bat, bobble and play with it. The campaign uses boxing as a comical comparison to the way cats play with the new toy. 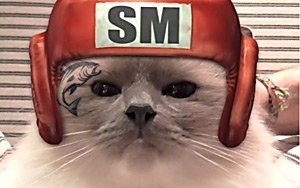 Creative elements include a print advertisement in the iconic style of a boxing announcement poster, and an online video in which live action cats box various animated opponents. The online video is featured on the Temptations Brands’ YouTube.com page and will be featured on the brand’s owned social media websites on Facebook and Twitter.There is paid support across YouTube, Facebook and Twitter to help drive scale and awareness. Snacky Mouse Rumble, a live animation action survival game is being featured on BuzzFeed.com and a link to the online video has been embedded in the post. The print poster ad will be appearing in national magazines such as Good Housekeeping, Parents, Redbook, Family Circle, InStyle and Us Weekly. The marketing effort also includes public relations and in-store marketing activations such as retail-specific product signage at shelf, as well as newspaper inserts. The product is unique to the marketplace, says Temptations Brand Manager Melodie Bolin. The marketing campaign is aimed at cat lovers everywhere, she adds.